Something smart, and inevitably, it’s for Paris. The company will premiere its forstars Concept at the show, and the shiny offering is an electrically-driven, two-seater sports utility coupé. Its name is a tongue-in-cheek reference to the glass roof above the passengers that provides a clear view of the starry sky. Additionally, a video projector in the front bonnet, which offers the chance to do your own drive-in experience (wall not provided), plays on the – movie – star theme. Exterior design cues include a saucy smile on a friendly looking face – it’s almost like a Cars character come to life. With convex and sensuously-shaped body surfaces, the forstars shares the main features of its body with the smart for-us. Like the smart for-us, the lower tailboard at the rear can also be opened electrically – the tailgate slides down in a parallel position, then the cargo floor including tailboard retracts by 280 mm, which then offers easy access to the cargo area. The charging socket for the high-voltage battery is found inside the right-hand tail light, whilst the left-hand one has space for a beverage can, keeping a drink handy. As for the video projector, it sits in the air scoop on the bonnet. 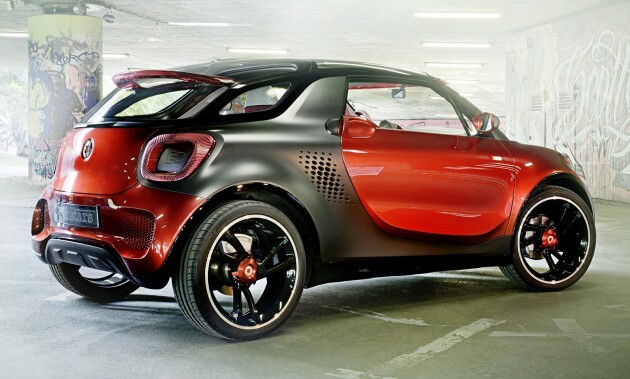 The 3.55 metre-long forstars rolls on 21-inch alloys and 245/35 Michelin sports rubbers, and is dressed in an extravagant wet-look red called alubeam rouge, working off contrast with the matte metallic titanium colour of the tridion safety cell. The cabin features more alubeam rouge as an accent colour, working with surfaces in mother-of-pearl white and brushed aluminium elements. As for the seats, these are trimmed with high-quality white bag leather, with white piping. The forstars is powered by a magneto-electric motor taken from the new Brabus smart electric drive, but power has been increased to 60 kW here, with juice provided by a 17.6 kWh lithium-ion battery. Other numbers include 135 Nm of twist and a top speed of more than 130 km/h. It’s like seeing Lighning McQueen from animation Cars jumped out into reality. Really ugly, so it will still be A-class. If it ever comes to M’sia, it should be priced around Beetle’s price bracket of RM140K-RM150K. Certainly it cannot be priced against A-class, no fight. some cars are beautiful, this one is unfortunate..
Would cause eyesore when viewed. Would becoming laughing subject when seen driven in this car. y the car looked so angry? 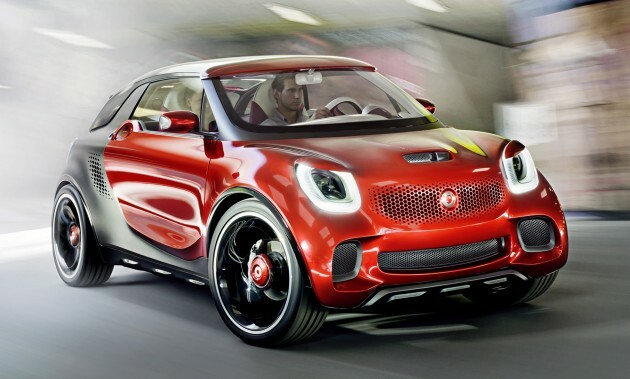 Congratulation Smart, you just have become a Nissan wannabe. And what with the eyelids? the front of this car looks like it will open its mouth and talk..
OMG ! They finally made a cartoon car !! I think this is a very interesting looking car. It looks futuristic and I am just fascinated with the features this car has. Why hasn’t anyone else thought of putting a projector inside of a car to create your own drive in? I really like the idea of having a clear roof because a sunroof doesn’t give you the illusion of being outside like a clear roof would, although it could be dangerous in the day with the sun shining through the car. Even though its not the most aesthetically appealing car, I think this is the right step in car innovation.